A dog lover strives to give troubled teens new purpose by training homeless pups. Growing up in West Baltimore, what Andrew Foster wanted was a pony. What he got was a stray French poodle that showed up shivering on his doorstep in the middle of a rainstorm. “She was such a hot mess, we couldn’t even tell what she was at first,” says Foster, who didn’t part ways with the pup until he left home to study photography at MICA. 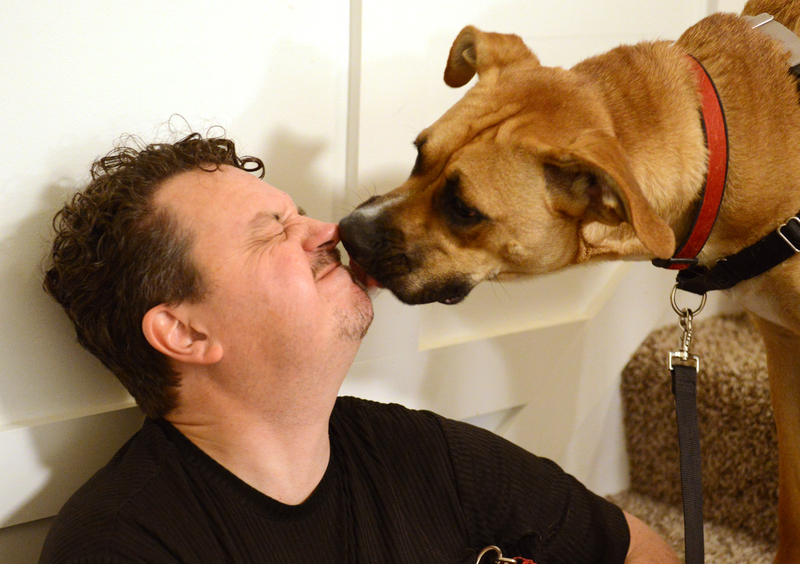 Circumstances prevented him from getting another dog for some time, but he never lost his desire for that unique companionship that only comes from loving a motley mutt. Fast forward 14 years, when a boxer named Santana wandered into Foster’s life. (“She basically took ownership of me,” he says.) Fortunately, Santana’s mom–Dee, now Foster’s longtime girlfriend–agreed with her taste in men. They moved in together shortly afterwards. Recently the couple decided to embark on a new joint venture: Pooch Camp, a three-week program that teaches at-risk youth to train and socialize shelter dogs for adoption.The model was inspired by K-9 Connection in Los Angeles, which Foster discovered by chance surfing the Huffington Post website. To me, every dog is a therapy dog. This story had a profound effect on Foster, who credits Dee and Santana with giving him a new leash on life after divorce. “To me, every dog is a therapy dog,” he says. Foster already has recruited the Pooch Camp board, including an obedience training expert from Mutt Mart, and he’s currently pitching the program to local shelters and city schools. “Ideally, I hope to partner with counselors to pick the kids who need this kind of program the most,” says the the Baltimore Polytechnic Institute grad who envisions students gaining 30 hours of community service–not to mention improved self-esteem, self-determination and empathy.